Moreover, several serious legal cases involving bad behavior by his company, and multiple other instances of apparently unethical behavior occurred on Mr Azar&#8217;s watch at Eli Lilly. So the fox might be not the most reputable member of the species. The ongoing parade of people transiting the revolving door from industry to the Trump administration once again suggests how the revolving door may enable certain of those with private vested interests to have excess influence, way beyond that of ordinary citizens, on how the government works, and that the country is still increasingly being run by a cozy group of insiders with ties to both government and industry. This has been termed crony capitalism. Poses is, of course, correct. (Personally, I’ve contained my aghastitude on Azar, because I remember quite well how Liz Fowler transitioned from Wellpoint to being Max Baucus’s chief of staff when ObamaCare was being drafted to a job in Big Pharma, and I remember quite well the deal with Big Pharma Obama cut, which eliminated the public option, not that the public option was anything other than a decreasingly gaudy “progressive” bauble in the first place.) In this post, I’d like to add two additional factors to our consideration of Azar. The first: Democrat credentialism makes it hard for them to oppose Azar. The second: The real damage Azar could do is on the regulatory side. “I am glad to hear that you have worked hard, and brought fair-minded legal analysis to the department,” Democratic Sen. Max Baucus said at Azar’s last confirmation hearing. Andy Slavitt, who ran the Affordable Care Act and the Centers for Medicare & Medicaid Services during the Obama administration, said he has reason to hope Azar would be a good secretary. “He is familiar with the high quality of the HHS staff, has real-world experience enough to be pragmatic, and will hopefully avoid repeating the mistakes of his predecessor,” Slavitt said. So, if Democrats are saying Azar is “fair-minded” and “pragmatic” — and heaven forfend that the word “corruption” even be mentioned — how do they oppose him, even he’s viscerally opposed to everything Democrats supposedly stand for? (Democrats do this with judicial nominations, too.) Azar may be a fox, alright, but the chickens he’s supposedly guarding are all clucking about how impeccable his qualifications are! 1. Azar clerked for Supreme Court Justice Antonin Scalia. 2. Azar went to work for his mentor, Ken Starr, who was heading the independent counsel investigation into Bill and Hillary Clinton’s Whitewater land deal. When Leavitt replaced Thompson in 2005 and Azar became his deputy, Leavitt delegated a lot of the rule-making process to Azar. On #1, The administration has, despite its best efforts, not achieved a controlled flight into terrain with ObamaCare; enrollment is up. On #2, the administration and its Congressional allies are still dickering with tax reform. And on #3…. That looks looks like a job for Alex Azar, since both essential health benefits and association health plans are significantly affected by regulation. So, yes, there are worse scenarios than the revolving door; it’s what you leave behind you as the door revolves that matters. It would be lovely if there were a good old-fashioned confirmation battle over Azar, but, as I’ve pointed out, the Democrats have tied their own hands. Ideally, the Democrats would junk the Rube Goldberg device that is ObamaCare, rendering all of Azar’s regulatory expertise null and void, but that doesn’t seem likely, given that they seem to be doing everything possible to avoid serious discussion of policy in 2018 and 2020. 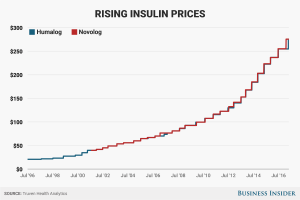 Over the 10-year period when Azar was at Lilly, the price of insulin notched a three-fold increase. It wasn’t just Lilly’s insulin product, called Humalog. The price of a rival made by Novo Nordisk has also climbed, with the two rising in such lockstep that you can barely see both trend lines below. The gains came despite the fact that the insulin, which as a medication has an almost-century-long history, hasn’t really changed since it was first approved. It’s almost like Lilly (Azar’s firm) and Novo Nordisk are working together, isn’t it? Anyhow, as of the 2016 Clinton campaign, the Democrat standard — not that of Poses, nor mine — is that if there’s no quid pro quo, there’s no corruption. This entry was posted in Guest Post, Health care, Politics on November 15, 2017 by Lambert Strether. Oh please, stop quoting Andy Slavitt, the United Healthcare Ingenix algo man. That guy is the biggest crook that made his money early on with RX discounts with his company that he and Senator Warren’s daughter, Amelia sold to United Healthcare. He’s out there trying to do his own reputation restore routine. Go back to 2009 and read about the short paying of MDs by Ingenix, which is now Optum Insights, he was the CEO and remember it was just around 3 years ago or so he sat there quarterly with United CEO Hemsley at those quarterly meetings. Look him up, wants 40k to speak and he puts the perception out there he does this for free, not so. I think you’re missing the context. Lambert is quoting him by way of showing that the sleazy establishment types are just fine with him. Thanks for the extra background on that particular swamp-dweller, though. Alex Azar is a Dartmouth grad (Gov’t & Economics ’88) just like Jeff Immelt (Applied Math & Economics ’78). So much damage to society from such a small department! From Rothschild to . . . . Since 2014, Ross has been the vice-chairman of the board of Bank of Cyprus PCL, the largest bank in Cyprus. He served under U.S. President Bill Clinton on the board of the U.S.-Russia Investment Fund. Later, under New York City Mayor Rudy Giuliani, Ross served as the Mayor’s privatization advisor. Or from a “small liberal arts college” (which is a university in all but name, because alumni). Well it’s never ending game in the beltway and we serfs aren’t in it. I don’t believe that the President’s “swamp” ever consisted of crooked officials, lobbyists, and cronies I think it has always consisted of those regulators who tried sincerely to defend public interests. It was in the sticky work of those good bureaucrats that the projects of capitalists and speculators bogged down. It is against their efforts that the pickup-driving cohort of Trumpism (with their Gadsden flag decals) relentlessly rails. Trump has made much progress in draining the regulatory swamp (if indeed that is the right way to identify it), and no doubt will make considerably more as time wears on, leaving America high and dry. The kind of prevaricator Trump is may simply be the one who fails to define his terms. I think we’ve moved past the revolving door. We hear members of the United States Senate publicly voice their concerns about what will happen if they fail to do their employers’ bidding (and I’m not talking about “the public” here). In the bureaucracy, political appointees keep accruing more and more power even as they make it clearer and clearer that they work for “the donors” and not the people. Nowhere is this more true than the locus through which passes most of the money: the Pentagon. The fact that these beribboned heroes are, in fact, setting war policy on their own makes the knowledge that they serve Raytheon and Exxon rather than Americans very, very troubling. I suspect Azar’s perception is that he is just moving from one post to another within the same company. I’m amazed there is enough private security available on this planet to keep these guys safe. Big pharma indeed has so much defense from the supposed left. It combines their faith in technological progress, elite institutions, and tugs on the heart strings with technology that can save people from a fate of ill health or premature death. Of course, the aspect of the laws being written to line the pockets of corrupt executives is glossed over. While drug prices and medical costs spiral ever higher, our overall longevity and national health in the US declines. That speaks volumes about what Democrats really care about.